If You Believe, You Can Achieve!Eliminate The Muda! « $7,100 In Cash And Prizes @ MoneyCrashers! Several months ago during a meeting a fellow associate went to the wall switch to drop a projection screen. He pressed the button; the screen came down about two inches from the ceiling and then stopped. He tried again with no results. He then tried to retract it back but it didn’t move. He pressed both up and down several times but it still didn’t work. He turned perplexed and stated the fact that the screen seemed to be broken. Still, a third person that had seen both attempts apparently didn’t believe it. She walked up to the button, pressed both up and down several times to no avail. Shortly thereafter one of our organizations executives walked into the room. She was advised of the technical glitch to which she immediately began pressing the button several times as well. How many times did the button have to be pressed for this group to be convinced that the screen was not going to come down? Why humans have a tendency to repeat the same mistakes may actually be rooted in the way our brains are designed. This article was featured in the Festival of Frugality hosted by the Pragmatic Environmentalism and Carnival of Money Hacks at Passive Income Now. Please check out this festival for many other great articles about personal finance. Professor Kevin Dunbar of Dartmouth University has helped to uncover why people seem to disregard factual information. In an effort to understand why scientists sometimes disregard information contrary to their hypothesis. Dunbar showed two videos to groups of students. 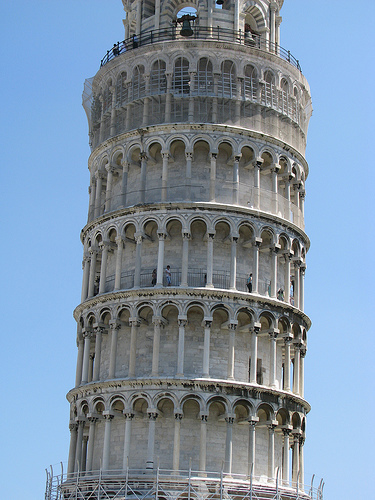 One had two different sized balls falling from a tower at the same rate (Galileo’s famous experiment from the leaning tower of Pisa). The other video had two different sized balls falling with the larger seemingly falling faster. One group of students without a background in physics had a hard time believing two different sized balls fell at the same rate. Watching the videos while being scanned by a fMRI machine the Professor noted increased activity of the anterior cingulate cortex(ACC). This portion of your brain is associated with perceptions of inaccuracies. Neuroscientists refer to this as an “Oh crap” circuit. Another group of students had a background in physics. When they saw the accurate video, their ACC circuit did nothing, but when they saw the video with two balls falling at different rates their ACC circuit lit up like Christmas lights. We all have this switch in our brain that is triggered when we perceive something is wrong. What I found more interesting was that the Professor also tracked the activity of our dorsolateral prefrontal cortex (DPC). This area of the brain is like a video editing machine. When we identify something we don’t believe in our DPC expertly removes this unwanted material from our mind’s eye. Naturally we simply ignore information contrary to our beliefs. We see what we want to see. So what do ACC’s, DPC’s and physics have to do with personal finance? Simply this, the content doesn’t matter. Physics or finances, we are prone to ignore our mistakes that we don’t fully understand. If we don’t know that gravity has the same effect on two different sized objects how can we believe in it when we see it. If we don’t know how, or believe in our own ability, to control our financial destiny we will be more likely to ignore or simply accept our lot in life. Taking the time to learn about financial management and believing that we can achieve wealth may be the difference between those that dream and those that achieve. 12 comments to If You Believe, You Can Achieve! 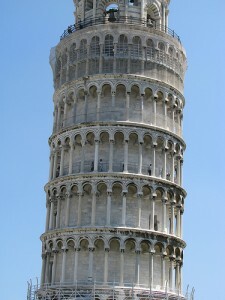 Lean – It’s kinda like me pressing the crosswalk button 5 times. Once is enuff, but I insist! lol. Toyota is kinda hurting us in the Samurai Fund btw, however the fund is KILLING the S&P so far by double, or 200 basis points! .-= Financial Samurai´s last blog ..The Best Post on Craigslist, And It’s All About Love And Money =-. Samurai-san – press it one more time. It will work, promise! On your Samurai Fund TM just needs to hang on past the bad press. With a #1 and #2 best selling car in America there is still hope. That’s really wild about how the brain processes information. Still doesn’t excuse everybody for flipping the freaking switch. One of my pet peeves is when people do stuff like flipping that switch when they know the screen isn’t coming down. It’s like they’re indirectly calling you stupid. TM’s got 2-1/2 months to make it back and then some. We’ll keep our fingers crossed. So far so good with ABM, up like 2-1/2% last time I checked, and better than I had anticipated. .-= David @ MBA briefs´s last blog ..Business Wisdom from Aesop’s Fables: 3 ways to deal with difficult people =-. David… Samauri-san should have bent the rules and let me go with F, after all they area Lean company! The good news is my real money has been doing very well with F! We all do the switch thing sometimes. Funny though, since I read a great book earlier this year called Management Rewired I have been catching myself often and stopping the stupid behavior! .-= LeanLifeCoach´s last blog ..A Fun Battle – Debt Reduction =-. Funny thing about the projector because it happened to me too. Does it mean that we’re going to invest the same way we did before the GFC? Ps. Thanks for putting my blog on the roll. Much appreciated. .-= Bytta @151 Days Off´s last blog ..Day 5: What Happens When Whales Become Your Client =-. You’re welcome for the link, I am interested in seeing what else comes from it. You will invest the same way. Unless you take the step to learn about how the investing environment has changed and what you need to do different to profit from it. Great thought provoking post…Like you said, another way of illustrating that famous Einstein quote. I wonder sometimes if we have a disconnect between our brains and our behavior. For example, we might KNOW that we can’t afford that car, but “car fever” trumps our brains and we do what we know is stupid. Coincidentally, I’ve read two books and run into 3 major articles in the last year that reveal the latest knowledge on hour our brains actually work. Based on my understanding you are more right than most may realize. There are disconnects in our brains. Many of our natural decisions may not be the best decisions. Emotion controls more of our life than logic. .-= LeanLifeCoach´s last blog ..Festival of Frugality – How To Eliminate The Muda And Live More Frugally Edition! =-. Any advice how to overcome the disconnects? How can we all become successful unemotional robots? .-= Ryan @ Planting Dollars´s last blog ..Another Day in Paradise for $5.50 =-. Ryan – What I learned is we need to become physicists. Well that is if we want our brains to function properly in the presence of gravity:-). Really it’s all about education. Teach yourself about money and wealth management and your more likely to achieve wealth. Teach yourself about scuba and sharks and your more likely to survive your dive!